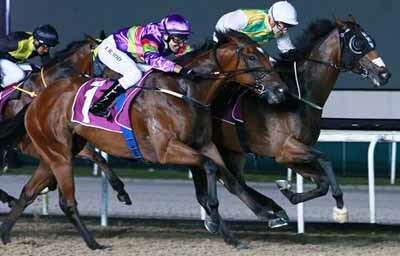 It took a polytrack specialist DISTINCTIVE DARCI to run down odds-on favourite COUNTOFMONTECRISTO in the S$500,000 Merlion Trophy (1200m) at Kranji here tonight. Top-rated COUNTOFMONTECRISTO, with seven wins from 11 starts behind him, was heading for victory when he took the lead in the home straight in the Group 2 sprint. when DISTINCTIVE DARCI charged home on his inside to claim victory by a neck. DISTINCTIVE DARCI has now scored all his nine wins on the polytrack, and his first group win, after four previous attempts in group races on the turf without success. "It was a big step-up for him tonight, and he’s come up with a fighting win," said trainer Mark Walker. "Distinctive Darci is such a fantastic big horse. He loves this surface, he won eight races on it before and now he’s won nine, which is wonderful as it’s his first Group win," said jockey Vlad Duric.